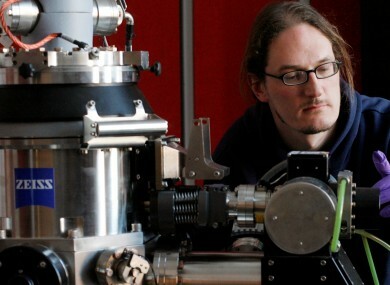 RESEARCHERS IN DUBLIN have achieved a breakthrough in the production of ‘wonder material’ graphene. Scientists at the AMBER, a materials science centre at Trinity College Dublin and funded by Science Foundation Ireland, have discovered a way to produce the material in industrial quantities. The substance is one the strongest known with a section 1mm thick being 200 times stronger than steel and a superconductor of electricity more than 1000 times more effective than copper. It’s also 97.3 per cent transparent and extremely bendable. However, it is extremely difficult to produce. Their findings are to be published in the Nature Materials publication, heralded as a ‘global breakthrough’. “This shows how industry and academic collaboration can lead to research of the highest calibre, with real commercial applications,” Prof Jonathan Coleman from AMBER said. Minister for Research and Innovation Sean Sherlock praised the team’s work, saying producing graphene in mass quantities is “something that USA, China, Australia, UK, Germany and other leading nations have all been striving for and have not yet achieved”. Thomas Swan Ltd have now signed a contract with AMBER to scale-up production. The project was part of the Graphene Flagship, spanning 17 countries with 126 academics as well as industry partners working on a common goal, and was part of the €1 billion research project announced by the EU, of which Ireland received 1 per cent. Email “Global breakthrough: Irish scientists discover how to mass produce 'wonder material' graphene”. Feedback on “Global breakthrough: Irish scientists discover how to mass produce 'wonder material' graphene”.